Soya bean, a delicious, slightly nutty flavored bean has been cultivated in China for more than 3,000 years. In India, soyabean cultivation was introduced in 1977. People started liking this pulse (mainly vegetarians) due to its high-quality protein. Supermarket shelves now carry a wide range of soya products such as chunks, flakes, granules, soymilk, soya curd, tofu (soya paneer), soya flour and of course the soyabean oil which you could use in your day to day life. It has surely proved to be the great flavor of fitness due to its nutritional and other benefits. The nutritive value of this wonder bean is enormous. Other than being the cheapest source of high-quality vegetable protein, it also has a good amount of energy and fat. The protein of soyabean contains all the essential amino acids in adequate amounts except methionine and cystine, due to which it is considered as the best vegetarian source as far as protein is concerned. It is a good source of vitamins thiamine, niacin, folic acid, carotene and a fair source of riboflavin. It is also a good source of mineral zinc. Soya protein helps in lowering cholesterol. It has been shown in some studies to be able to lower total cholesterol levels by 30% and to lower LDL or "bad" cholesterol, levels by as much as 35-40%. It may also be able to raise HDL or “good” cholesterol levels. 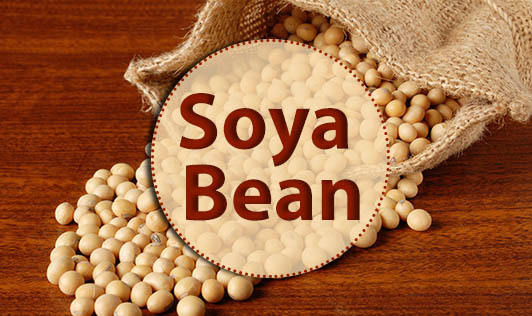 Soyabeans are regarded as equal in protein quality to animal protein. Just one cup of soyabean provides 57.2% of the Daily Value (DV) for protein. There are active isoflavone compounds found in soya, specifically, genistein may help us stay lean by causing us to produce fewer and smaller fat cells. Soya bean is a good source of omega-3 fatty acids helps in preventing the formation of blood clots, which happens mostly in atherosclerosis patients, thus preventing heart attacks or stroke. Isoflavone-containing soya foods significantly inhibit bone loss and stimulate bone formation in pre-menopausal and menopausal women, by helping in better calcium utilization in order to ward off the agony of osteoporosis. It contains many compounds which can powerfully influence the reduction of the risk of cancer. Soya products also help in having a good control over the blood sugar levels as it’s a good source of fibre. The protein and fiber in soybeans can also prevent high blood sugar levels. Soya foods contain complex mixtures of bioactive compounds that interact with one another to promote health. Myth: Soya is unsafe as it causes allergy. Fact: Although allergic reactions can occur to virtually any food, research studies on food allergy consistently report more problems with some foods than with others. It's important to realize that the frequency of problems varies from person to person. Soya foods are the last among the eight most common food allergens; a list that also includes wheat, cow's milk, hen's eggs, fish, crustacean shellfish like prawns, crabs etc., tree nuts like cashews, almonds, walnuts etc. and peanuts. Like any allergen, soya is harmful to those who are allergic to it, but this has no bearing on the safety of soya for the general population. If you know or suspect you are allergic to soya, consult your doctor/dietitian for dietary guidelines and always read food labels with care. Myth: Soya & its products are not advised for pregnant women. Fact: There is no scientific evidence that soy is unsafe for pregnant women. Soya products like soy milk, tofu, etc. are delicious and convenient sources of many nutrients that are important in pregnancy including calcium and high-quality protein. Soyamilk is also lactose-free, which may be helpful to some pregnant women with lactose sensitivity. If you are not sure, you can always ask your doctor/dietitian before consuming soya. It is always better to ask your doctor/dietitian before consuming soya. Add soya flour in chapati dough, dosa batter and to the porridge you make. Soya flakes & granules can be added to any dish you prepare. Add it into the sandwich/ paratha filling, cutlets, breakfast foods, vegetable dry/gravies, soups, rice preparations, etc. One advantage of these flakes or granules is that they have a bland taste. Just soak it in hot water for 2 minutes; squeeze out the water and add it to the dish and it'll take up the taste of your dish without making any changes to the taste of the dish. Use soya milk as a substitute for the regular cow’s milk. Instead of the regular paneer made of cow’s milk, you can use tofu (soya paneer). Add sprouted soya bean to your sprouts salad. Now that you understood the soybeans nutritional value, we hope you will increase your soybeans intake to reap the numerous skin, hair and health benefits.